Like most people, I have my “go to” cookie recipes, but I have also been wanting to play around a little bit with different flours and non-butter options. 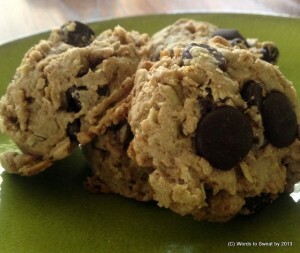 So, I was super excited to find this oatmeal chocolate chip cookie recipe from Cheeky Kitchen. As you know from the mantra workout towels, I love a little sass so it was fun to read Brooke’s post because she lives up to her “cheeky” moniker. Plus, the the recipe not only includes spelt flour (yes, that is spelled correctly), but also coconut oil instead of butter. After making it several times, I have adapted it slightly and my version is below. In a medium-size bowl, beat the coconut oil, egg, and brown sugar together until completely mixed and it has an overall smooth texture. In Brooke’s recipe, she uses a standing mixer, but since I don’t have one, I have been doing it by hand and they turn out just fine (fortunately). You can tell you’re finished blending it all once the mixture looks like dough and there aren’t clumps of oats or flour on the side of the bowl. Throw in the chocolate chips and mix it all again. There will be chocolate chip stragglers, but you can blend them in once you’ve started making the cookie balls. Use a cookie scoop or your hands to form 2″ balls and place them on a cookie sheet. This should yield about 12 – 14 cookies. Bake in a preheated oven at 350 degrees for 8 – 10 minutes or until the cookies look like the once round tops have flattened slightly and the cookies have ‘set’. Transfer the cookies to a cooling rack and allow them to cool completely. After you make them, leave a comment and let me know how they turned out! These ar very tasty…I substitutd the brown sugar with Xylitol. The sweetness was good but the cookie seemed a little dry and the balls never really flattened out much. Still tasty, but not sure about the dryness. Any thoughts on that? Thanks for commenting. I am so happy to hear you enjoyed the recipe and even better that substituting Xylitol works with the flavor. What I learned after making several batches is that the balls never quite flatten, but just kind of ‘set’. To me this looks like the bottoms have flattened just the tiniest bit but the round shape remains overall. It is also best to let them cool completely. Regarding the dryness, I’m not sure what to recommend since I haven’t baked with Xylitol and don’t know how it effects the overall recipe. I will say that mine come out fairly dry but not to the point of being chalky or difficult to eat. It’s certainly a different texture from a butter-based cookie. What I might recommend is that you do a little less than a cup of spelt flour? That might help with the dryness. I’ve also learned that I have do to a single batch at a time; doubling somehow just doesn’t work.